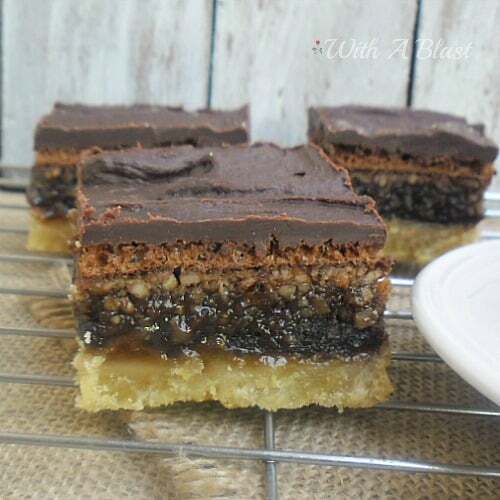 Oh my, these Gooey Chocolate Peanut Bars are amazing ! This is any peanut lover’s dream (not peanut butter.. peanuts!) although it tastes a lot like peanut butter bars. And with the Chocolate filling it is outstanding. To be honest, I have no idea exactly how these bars formed as you can see above. It starts with a simple buttery crust, a chocolate custard, peanut filled layer and topped off with a chocolate icing. Most of the chopped Peanuts ended up above the chocolate custard layer, with a touch of chocolate cake just under the Icing. I have made this recipe twice now and it is definitely a no-fail recipe and was a winner every time. You could cut the bars a bit smaller – mine is about 2 x 2 inches ( 5 x 5cm ). But half the size would work perfectly if you intend to serve it as part of a sweet platter at a party. 2.) CRUST : Beat together the Butter and Brown Sugar until creamy – add the Flour cup by cup, beating continuously – press the batter into the prepared oven dish – bake 15 minutes. Oh YUMMO I want some now! Thanks for linking up .. I am intrigued by the addition of apricot jam. These look amazing though! Oh these look absolutely fabulous! I have pinned this! Thank you so much for sharing this on Meandering Mondays and have a great week! Apricot with chocolate and peanut butter?! I've got to try it! Found you on Whatever Wednesdays! 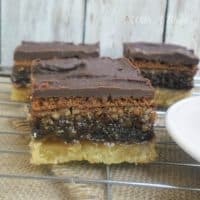 Your Chocolate Peanut Butter bars look absolutely mouth watering and will be a recipe to try for sure. Thank you for sharing with the Clever Chicks Blog Hop! I hope you’ll join us again next week! I can just imagine these as bite sized treats at a party. The plate would be emptied in no time at all! Thanks for linking up to Marvelous Monday at Smart Party Planning. This was one of our readers favourites and will be featured next week! I love no fail baking recipes…especially since baking is my nemesis! Pinning these…they look delicious! Those looks SO tasty! 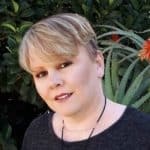 I'm going to share on my social media! 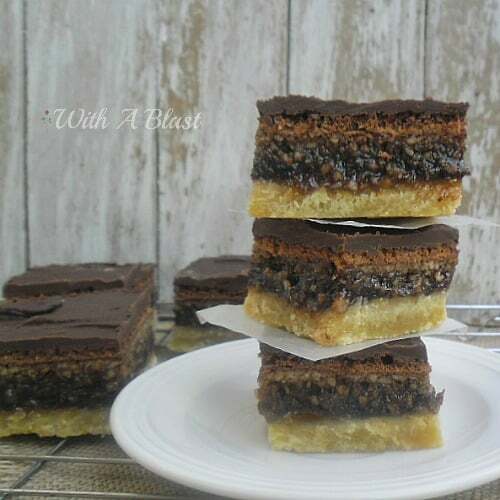 Delicious chocolate peanut bars thanks of sharing with Hearth and soul blog hop pinning. I just love your recipes…thank you for another great addition to my recipe board! The apricot jelly is a surprising element in the ingredient list. These look delicious! Thanks so much for linking up to Awesome Things Tuesday! Hope to see you next week. Thanks so much for linking up at Teach Me Tuesday last week. You are very much appreciated. Hope to see you again this week. Starts tonight at 8PM CST. This looks so amazing! Definitely making this! 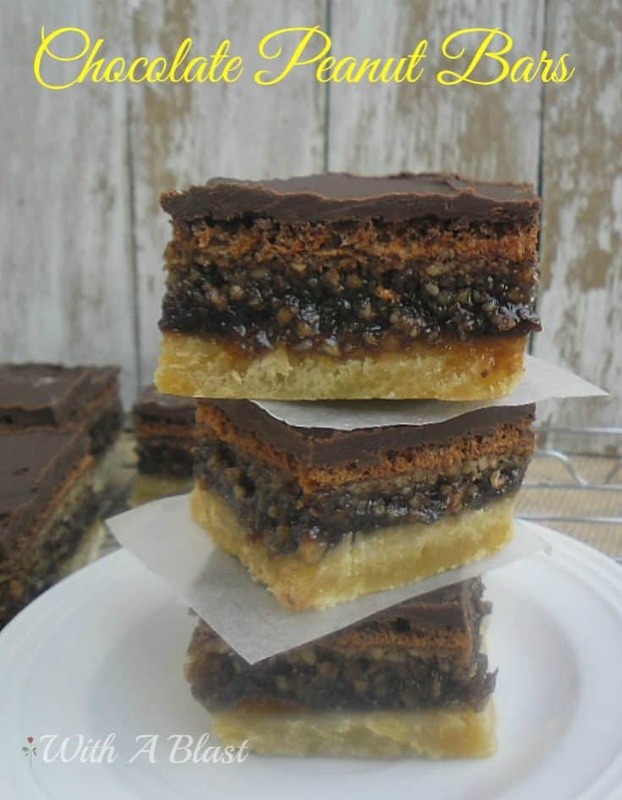 Your Gooey Chocolate Peanut Bars look like such a treat, Linda! Pinned 🙂 Thank you for sharing them with us at the Hearth and Soul hop. I just love your Gooey Bars, yum! This is a fantastic recipe and thanks so much for sharing it with us. Hope to see you again real soon at Full Plate Thursday! Those sound yummy, especially with the apricot jelly in the crust! Thanks for sharing at On Display Thursday. Honestly Linda I bet I could gain 10 lbs just looking at your delicious desserts. Drooling over this one! yum.Thanks for sharing at Foodie Fridays. Hope to see you there again tomorrow! Wow Linda!!! These look amazing. Thanks so much for sharing with Adorned From Above's Link Party.